by Betsy: Embracing the Yuck. 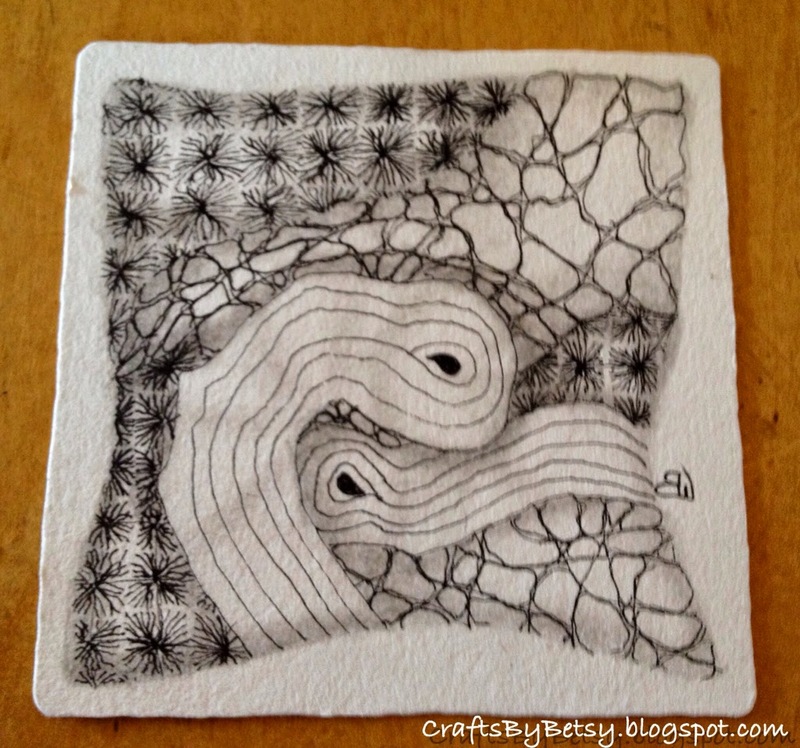 Or why imperfections are perfectly Zentangle®. Embracing the Yuck. Or why imperfections are perfectly Zentangle®. The Diva's challenge this week (#194 by guest blogger Elisa Murphy) was to "Embrace the Yuck" by tangling a tile using your non-dominant hand. I admit I put this off for awhile. Did I really want to put something out there that would, no doubt, be less than amazing? (I can be a bit of a perfectionist.) Then I just decided that I needed this. And to truly embrace it, I needed to go beyond the requirement of simply drawing with my non-dominant hand. So what would it be? How about going to an unfamiliar, public place and tangling? Sure, why not? So off to a place I've been wanting to check out, Latte Da, a lovely little (tho busy) coffeehouse in Vancouver WA. I ordered my tea (no, I'm not a coffee drinker, tho in hind site, that would have been yuck for me!) and sat at a table and drew. The tea, Tranquility, came and I tangled on, making myself remember to stop and drink from time to time so it wouldn't get cold. I did everything with my non-dominant hand except hold my tea cup! From pencil string, pen strokes, shading, initialling and even signing the piece I used my left hand. As I was drawing, I noticed that I preferred to push my pen stroke away from me, where with my right hand, I usually prefer to pull it toward me. I also was a little disappointed when every so often I actually had a smooth flowing line. I liked the consistency of the wobbly lines better! Well, for this tile at least. I took a few photos and then decided that to truly embrace it, I'd give it away. My friendly waitress was the recipient. I explained the challenge and I did apologize to her that she was the recipient of my "Yuck" tile. She thought it was lovely and you know what, so do I. Imperfections simply are Zentangle. Imperfections are life! Tangles: Dansk, 'Nzeppel and Ilana. Love your Challenge experience, Betsy. Terrific handling of your lines. Love your Nzeppel, and your shading is beautiful. You created terrific highlights. Indeed, the waitress is lucky. I love your challenge tile this week, for some reason the wavy line quality really works in this one. I agree with David, Luck waitress. Thanks for telling this challenge story, a great post! Well done. Love the Ilana.